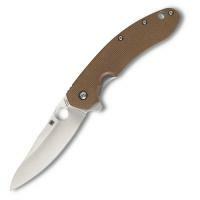 Spyderco C156GPBN C156GPBN Southard Brown Plain Edge Folding Knife FREE SHIPPING! Spyderco has joined forces with coveted knife talent Brad Southard to introduce the Spyderco C156GPBN Southard Brown Plain Edge Folding Knife. A Spyderco exclusive, the Southard Brown Plain Edge Folding Knife features an opening mechanism spearheaded by knife royal Kit Carson. The eponymous Carson Flipper utilizes a non-obtrusive fulcrum that projects from the Southard's base, and hollow-ground sheath projects from the C156GPBN's spine when closed. Using your pointer finger, one can close the Spyderco C156GPBN Southard Brown Plain Edge Folding Knife using pressure on the recessed mechanism that keeps the sharp edge safely tucked away. When deemed necessary, the knife can snap open with threat using a ball-bearing pivot component. The grip of the C156GPBN is etched in G-10 scale for slip-free and safe handling, and boasts a durable titanium liner on one side and solid titanium scale on the flip. In addition, the C156GPBN uses an RIL (Reeve Integrated Lock) that serves as an overtravel stop, and the flip knife comes equipped with a stainless clip for convenient and safe tip skyward and right-handed carry. ©2002-2019 CopsPlus.com: Spyderco C156GPBN C156GPBN Southard Brown Plain Edge Folding Knife FREE SHIPPING!